This is how it used to work. For many years I operated walking tours in Central Australia. I would start walking again after resting during the off season, and I mean resting. I did almost nothing for six months apart from daily walks with Tommie, some serious lounge surfing and a little reluctant pottering around the garden. The first day back on the track was as close to hell as you can get without suffering third degree burns. The second was worse. The third usually started with my body feeling not like it had been on a torturer's racks, but was currently on the rack, just before the ligaments snap like a busted violin string. Then on Day Four, abracadabra, I was ok and rejoicing in the weight of the pack and the exercion of the climb up desert mountains. I was reborn. I was home, not just in the desert but in my body. I fear it won't be that like this time. After just a few days of pulling my rickswag I can safely say it will be weeks/months before I reach that beautiful, exquisite place of physical well-being. For a start I had a heart attack 11 months ago. Where I used to find my old body within days, I have to trust that this new version, post heart attack, can adjust to the task of walking, to be effortless in movement, without a chorus of groans. It is not fitness for fitness sake, but physical capacity to engage easily with the wilderness, to connect to the natural world. We have been sold a pup I think, that old age is about 'comfort'. I sense my older years will be happier for the absence of it, for the reliance on my body to take me places that cars can't, deep into the experience. This Big Walk is as much about finding that physical sense again as collecting stories of this country. Physical strength, endurance and health are carriageways to that external space, a way of feeling at home with and in it. Young Ralph has taken to the walk well. I believe he sees pulling the rickswag as his job. For the first hour or so he pulls and strains like a husky before adopting a perfect heel beside me as he tires. I think he's a little beauty. Yep, I think little Ralph will be a gorgeous friend, especially when he starts to return to me on command. That's a concern for me because there are lots of dangers out there. I don't want him to have to live on the end of a restraining lead. My sense is that we will become great mates, Ralph and me. I met a farmer the other day with a face like crumpled sin. Until he spoke at least. Then he said ... that dog will be as good as the love you give him ... and he smiled a transforming smile to accompany his Buddhist aphorism. It's early days, this Big Walk, but I am on the journey and just for a moment, on that first day, and briefly on the second, I felt happier than I have for an age. Thank you for this lovely blog post. we come to an understanding ,don't we, of the spirit of place that are the spirited places we travel through and within,we reach an accommodation with them and an understanding of self. Ralph and you are are a team already and probably more ready that you feel for the journey ahead just needs your bodies to catch up. Hey Lee. I thinbk we are becomong a team, albeit with one member who doesn't do what he's told. My sentiments exactly lee Bruce. Please take it easy Raymond.one day at a time. Lovely blog. I agree. It will be my mantra with this little guy. It was with Tommie and I didnt even realise it. Lovely, lovely post, Raymond. I agree with you, in that the last thing we should be seeking is comfort as we get older. I struggle with that every day as it just seems easier to think about it than do it! There is great humility and humour for me in getting older. I have learned to laugh at the hubris I once had, thinking that *I* would never get old. I try every day to find that line between pushing hard enough to keep my life from becoming smaller and knowing when I have to step back so I can push again tomorrow. And wee Ralph...he's a good boy. 'Nuff said. a very wealthy friend of mine recently showed me some photos of himself on holiday. He was riding a camel with about ten other men who also looked wealthy and they all had the exact same hump in the their bellies about the same size as the camel. It was a classic portrait of middle age spread. I didnt feel envious. Yes Jenny .. His welfare is paramount as was Tommies. I wonder how little dingo puys used to go on long walkabouts. They simply would have had to keep up. Ralph is nearly 5 months now and getting quite strong. I am looking forward to reading of your new adventures with Ralph. You are an inspiration and whet our appetite for exploring every inch of this glorious country we are lucky enough to live in. Happy travels! Hey Raymond, I am reading this after my return from my daily grind of 9.123123km carrying a backpack of just under 18kg, in preparation/training for my probably first and last ‘long-distance’ hike of 135km, with a full backpack, in May. Ha, long-distance – pales into insignificance when reading what you are doing! Recently, someone told me that I am mad and that ‘people (my age) do far too much walking’. Made me think that to know someone who is way way madder than I is a privilege. But you know, you will be walking into a FREEDOM in every which way that only very few people will have the courage to do. Walking is good for body and soul. Now, I have a question: Will you grow long hair and a beard? Hi Cecila. Good on you. Thats a long walk. I've not completed mine yet and it might take a year but already just getting out of Sydney my spirit is lifting from the walking. Thank you for the package. It is very generous of you. I just love what that farmer said about Ralph being as good as the love you give him - brought tears to my eyes! Take it easy on the road - you've been through a lot. It was a classic. And it has affected the way I am bringing the little guy up. What a fascinating post. Love that Ralph is taking his work so seriously. He sure is a little beauty, and I suspect his not returning on command may be a bit of teenage rebellion just now. But of all the wonderful quotable things in this post, the one I like best is "a face like crumpled sin." Good one, Swagman. Be great to get up around Coward Springs Lisa. Soe great stories there. enjoyed the walk in Rookwood cemetery, consoling to know that the the rail journey was 'free if you were dead'. Hi Christine .. Yes I was happy with that one. I will combine the Camperdown Cemetery story with the ending of the Necropolis I think. Well done I think as you feel like hell I think you should have plenty of Magnesium in your pack for days when the muscles yell for help Also if it is at all possible to have a hot Epsom bath where you are staying then that will also please the personal transport (yourself). We in Blackheath lnow only too well how bloody cold it gets & it will get colder before long so I wish you & master Ralph a great trip & I hope you find the peace you crave & need as we all do. I found mine here after years of health issues & I hope you soon are enjoying the freedom of the road. Stay awhile in Blackheath & be safe. 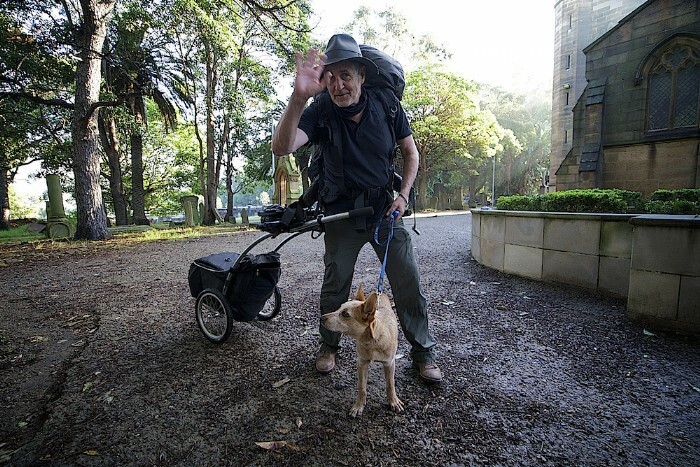 We are a good mob up here & we will all welcome Master Ralph & so will our dogs.It is almost manaditory to have a dog if you live here so he will not be short of friends.I hope we manage to see you both around the area & to be able to pass a few moments of time. Nature is not happy right now so stay awhile & be safe where you are welcome.